On March 25, 1927 a well-dressed couple boarded a train at the Gare du Nord. A shot was heard, followed immediately by another. When the conductor opened the door to the compartment, the woman gasped, "I did it," before collapsing. The woman who pulled the trigger was an twenty-seven year old American heiress named Alice de Janzé, married to a French count. The victim was her lover, 32 year old Raymund de Trafford, the son of an English baronet. Raymund had informed Alice that couldn't marry her. His parents, who were strict Catholics, had threatened to disinherit him if he married her. Alice had tried desperately to change his mind . She managed to get him to agree to lunch before he left. After they ate, the couple went to visit a sporting goods store where Alice insisted on buying him a present. Raymund chose some knives and a twelve-bore shotgun. Alice purchased a small revolver, a 3.8 caliber Colt with a pearl inlay handle and a box of nickel-plated bullets. At the station, Alice went to the Ladies room, unwrapped the gun and loaded it with bullets. Her plan initially was to commit suicide, to die in the arms of the man she loved, but she changed her mind. Instead, at the last minute, she decided that if she couldn't have Raymund then no one else could either. As Raymund bid her farewell, she leaned forward to kiss him, throwing her arm around his neck. With her other hand, she removed the pistol from her bag, pressing the muzzle against his chest and pulled the trigger. He collapsed. She then shot herself in the stomach. While Alice's wounds were superficial, her lover was in critical condition. When Alice heard that Raymund was not expected to live, she reportedly began screaming, 'But he must live! I want him to live!' The incident later inspired a similar scene in F. Scott Fitzgerald's 1934 novel, TENDER IS THE NIGHT. The French police planned to press charges against the Countess, accusing her of attempted homicide, as soon as she had recovered enough to speak to them. At first Alice declined to cooperate with police stating 'I decline to give the reason for my act. It is a secret.' Later she made a statement admitting her plan to commit suicide, but that she had decided to take him to 'the Great Beyond' with her. She was held briefly at the women's prison St. Lazare in the same cell that once boasted Mata Hari. Eventually she was released on bail, convalescing at the family chateau in Normandy until the trial. Her defense attorney pleaded that she suffered from chronic depression and tuberculosis which lead to temporary insanity. In the end, Alice received a six month suspended sentence and a fine of 100 francs ($400). The court even rebuked Raymund for reneging on his promise. Two years later, she received a full pardon. Alice's maternal relatives, the Armours and Chapins of Chicago, tried to do damage control with the press, but Alice was a scandal on both sides of the Atlantic. It was not the first time that Alice made headlines with her exploits nor would it be the last. 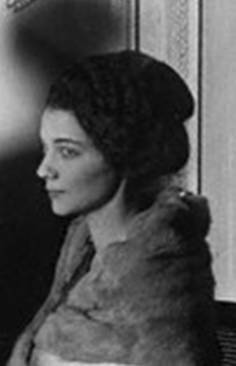 Born on September 28, 1899 in Buffalo, NY Alice was the pampered only child of William Silverthorne and Juliabelle Chapin, who came from Chicago royalty, her mother was an Armour of the meat-packing family. Her parent’s marriage was a misalliance from the beginning. Her father traveled constantly, leaving her mother alone and lonely. When Juliabelle accused William of cheating with her cousin Louise, he locked her out of the house in the middle of winter in Buffalo. Six months later, Alice's mother was dead of vascular laryngitis. A year later he remarried to Julia's cousin, the woman he'd been accused of having an affair with. Alice was a daddy's girl and William indulged his oldest daughter, taking her with him when he traveled to Europe. Precocious, dressing far above her years, Alice's father didn't always identify his beautiful companion as his daughter. Alarmed at the way she was being raised, her mother's family petitioned the court to remove her from his custody, and then proceeded to dump her at a boarding school in Washington D.C. Alice suffered greatly from that moment on she would be sensitive to any sign of male desertion. At the age of 18, Alice was transcendently beautiful, with big, almond shaped eyes that she used to devastating effect, dark curly hair which she ruthlessly straightened, and bow lips. She had a ready captivating laugh, throwing back her head, and a low sultry voice. Her combination of fragility and brazenness appealed to men. Bored with the Chicago deb scene, Alice began to hang out in the jazz clubs, enjoying a brief relationship with a local gangster. Horrified at her reckless behavior, her family banished her to Paris as punishment. It had the opposite effect. She took a job briefly in a dress shop, indulging her passion for fashion, before marrying Frédéric, Count de Janzé in 1921. Like many young women of her class, Alice married chiefly to gain a measure of independence. Alice soon realized that she had made a mistake. While Frédéric was kind, sensitive and loving, Alice found that she was unsuited for the life of a Countess with all the rules and regulations of French society. Even the birth of her daughters Nolwen and Paola didn't help. Alice suffered from post-partum depression and found it difficult to bond with her daughters. She also suffered from a form of bi-polar disorder, there were no mood stabilizers at the time that she could take, at the most electro-shock therapy was the prescribed treatment. Frédéric's brother and sister-in-law were particularly unsympathetic to Alice's melancholy, believing that she should just get over it. It was Frédéric’s idea that they take a trip to Kenya in the hope that a change of scenery would help her melancholy. It worked better than he could have possibly imagined. Within days, Alice had decided to buy a farm in the Wanjohi Valley. She soon amassed a plethora of pets including a monkey named Rodrigo, two abandoned lion cubs, several dogs, and a baboon named Valentino. 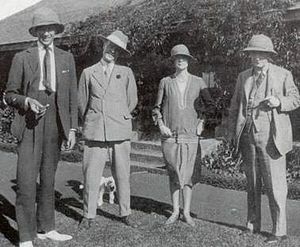 The couple became close friends with Joss Hay, the Earl of Errol and his wife Idina. Soon Alice and Joss were lovers which was fine with Idina, who had her own scandalous love life. Idina and Alice actually became very good friends. When Alice met Raymund de Trafford it was a coup de foudre both of them. Raymond was the younger son of a baronet, whose family could trace their ancestry as far back as King Canute. Within days of meeting, they were lovers. Her husband hoped that the affair with de Trafford would be as casual as her affair with Joss but he soon realized this his wife was slipping away, enthralled with Africa and de Trafford. For Alice, Raymund was not just a great love but a way out of her marriage. Her lover however was not as committed. She and Frédéric agreed to a divorce, he was awarded sole custody of their two daughters. After her trial for shooting Raymund, Alice was persona non grata in Kenya in light of the scandal. Kept away from her home, Alice bounced between Paris and London trying to woo Raymund back. She finally succeeded in 1932, after having her previous marriage annulled. But the marriage to Raymund didn’t last, after three months the couple called it quits. They argued about where they were going to honeymoon. When Alice reached into her purse, Raymund thought she had another gun. He fled to Australia. Now that she was a respectably married woman again, although separated, Alice returned to Kenya where she spent the last nine years of her life. Alice rarely saw her children, Nolwen and Paola, although they never blamed their mother for basically deserting them. 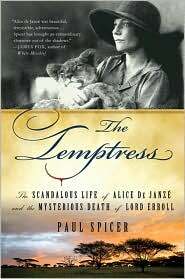 Alice spent remaining years of her life taking care of her animals (including lions, panthers and antelopes) and reading. She had also become heavily addicted to drugs, particularly morphine. She was almost feared by certain members of the community due to her rapid changes of mood and the aforementioned shooting incident. Her friend, aviator Beryl Markham, later stated of her: "Loneliness fixed Alice. Everyone was frightened of her". When her former love Joss Hay was found murdered in early 1941, Alice was a prime suspect. Alice however had an alibi; she had spent the night with a new lover Dickie Pembroke. Sir Jock Delves Broughton was tried and acquitted of the murder, but there is speculation to this day that it was Alice. That she was so distraught over his love affair with Sir Jock’s wife, that she decided that if she couldn’t have him, no one would. In late 1941, Alice was diagnosed with uterine cancer. On September 23, 1941, she attempted suicide by taking an overdose of pentobarbital. When her friend, Patricia Bowles, went to her house, she discovered Alice had already marked every piece of furniture with the name of the friend who would inherit it. She finally succeeded in ending her life seven days later. A servant found her dead on her bed, killed by a self-inflicted gunshot, with the same gun she had once used on Raymond and herself two days after turning 42. Alice left three suicide notes, one addressed to the police, one to her daughters and one to Dickie Pembroke. The content of the letters was never revealed, fueling rumors of containing possible revelations. The late mystery writer, Michael Kilian, who featured Alice as a character in his novel Sinful Safari, believed that she chose suicide because she was depressed about her age and losing her looks. Although she'd had a string of lovers, Alice never found lasting happiness. It was a sad end to a life that had so much promise. Alice was played by Sarah Miles in the 1988 film White Mischief based on the book of the same name by James Fox. Wow, what an enthralling life! I'm amazed Raymond agreed to marry her - can you imagine being petrified you were about to die every time your wife reached into her bag? It was a very strange relationship. I can't imagine marrying someone who had shot me, but people have done stranger things! Allowing for the post-partum depression, effects of oldstyle ECT and morphine addiction, this dear lady reads as a good old fashioned baggage... a fiction writers dream character, they can do almost anything you want!! If Alice were a fictional character, you would think that she was over the top! Keeping a lion cub named Samson, neglecting her children, the drugs, the drama, but it's fascinating isn't it? The rich truly are different.